Age-related macular degeneration (AMD), a degenerative disorder of the central retina, is the leading cause of irreversible blindness in the elderly. The underlying mechanism of the advanced form of dry AMD, also named geographic atrophy (GA) or atrophic AMD, remains unclear. Consequently, no cure is available for dry AMD or GA. The only prevention option currently available is the Age-Related Eye Disease Study (AREDS) formulation, which has been demonstrated to slow down the progression of dry AMD. This review summarises recent advances in therapy for dry AMD and GA. Building on the new understanding of the disease and recent technological breakthroughs, numerous ongoing clinical trials have the goal of meeting the need to cure AMD. Therapeutic agents are being developed to target the key features of the disease, including inhibiting the complement pathway and other inflammatory pathways, reducing oxidative stress and protecting retinal pigment epithelial (RPE) cells, inhibiting lipofuscin and visual cycle, regenerating RPE cells from stem cells and restoring choroidal blood flow. Some of these therapeutic options, especially the stem cell-based therapy, hold great promise, which brings great hope for this devastating blinding disease. Features of GA in the human samples. Morphologic features of human donor eyes stained with H&E. Healthy retina is characterised by the presence of a single layer of pigmented and polarized RPE cells (A and B). GA is characterised by RPE cell death and detachment from the basal membrane (C and D). RPE are swollen, characterised by shrunk nuclei and lack of polarisation. Arrowhead indicates transition zone. The visible gap between RPE and photoreceptors in C is an artefact created during sample preparation. Scale bar: 25 μm. GA, geographic atrophy; RPE, retinal pigment epithelial. 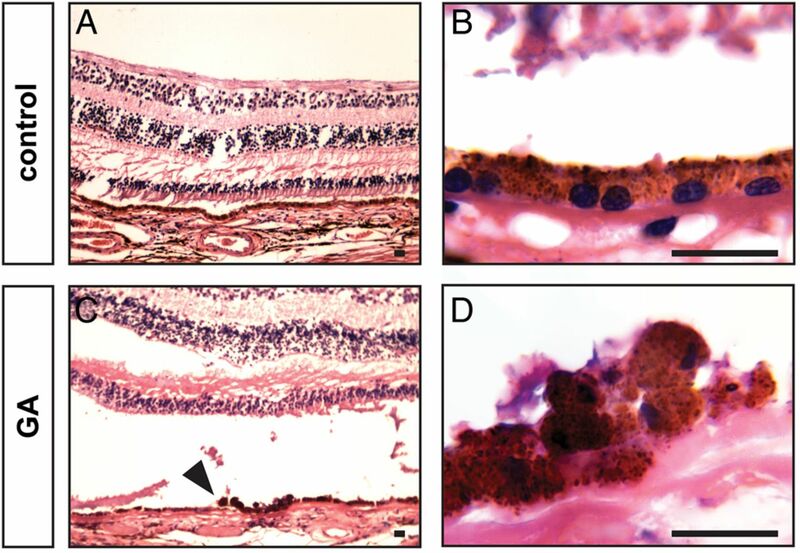 Chronic inflammation is believed to play an important role in AMD pathogenesis.19 Extracellular drusen deposits, located between the RPE and Bruch's membrane, contain RPE debris (including apolipoprotein E) and inflammatory proteins, such as complement components and complement activators. This suggests the involvement of inflammation in early pathogenesis of AMD.20 Drusen accumulation together with oxidative stress can result in RPE cell damage or death, leading to sustained inflammatory response resulting in the progression of AMD. Polymorphisms in the complement pathway, including complement factors H, B and I, and complement components 2, 3, and 7 have been shown to be associated with AMD.21–25 Activation of the complement pathway leads to the formation of the membrane attack complex that causes target cell lysis and chemokine release, which in turn can recruit inflammatory cells and increase vascular permeability.26 Inhibition of the overactive complement pathway and other inflammatory pathways represents a viable therapeutic approach for halting AMD and GA.
Zimura (ARC-1905) is a PEGylated synthesised single-strand nucleic acid aptamer that targets and inhibits complement factor C5 by blocking the cleavage of C5 into C5a and C5b fragments.30 Phase I trial for dry AMD evaluated the safety and tolerability of intravitreous Zimura injection in patients with GA secondary to dry AMD. Fifty participants (50 years or older) with dry AMD (drusen and/or GA) in both eyes were recruited. The study was completed with no results being posted, but Ophthotech plans to initiate phase II/III clinical trial investigating Zimura for the treatment of GA.
Lampalizumab is a humanised monoclonal antibody targeting complement factor D in the alternative complement pathway. In a phase II trial, lampalizumab showed a reduction rate of 20.4% in the GA area at 18 months in patients with advance dry AMD.31 Phase III study is currently recruiting participants with estimated enrolment of 936 participants at age 50 years and older. Participants with well-demarcated area or areas of GA secondary to AMD, but no CNV in both eyes will receive a 10 mg dose of lampalizumab administered intravitreally. Primary outcomes will measure change in GA area after 48 weeks, and best corrected visual acuity (BCVA) up to 2 years after the beginning of the study. Copaxone (or glatiramer acetate) functions to induce suppressor T cells and downregulates inflammatory cytokines.36 A phase I trial was designed to test its safety and efficacy in the prevention of GA progression or conversion of dry AMD to neovascular AMD. The recruitment of participants has been suspended with no results posted yet. Oxidative stress has been suggested to be a critical component of AMD pathogenesis.37 Oxidative stress can lead to the damage and degeneration of the RPE layer, which is crucial for maintaining the homeostasis of the retina. In support of a critical role for oxidative stress in AMD, cigarette smoking, which induces systemic oxidative stress, is a proven risk factor for AMD.37 Modified oxidative products, such as carboxyethylpyrrole and malondialdehyde, have been shown to cause inflammatory response and retinal phenotypes in animal models similar to that in AMD.38 ,39 Amyloid-β, major proinflammatory component of the plaques in Alzheimer’s disease, was also observed in drusen and was correlated with the location of degenerating photoreceptors and RPE cells.40 On account of these findings, antioxidants and amyloid-β inhibitors have been tested in clinical trials for preventing AMD and GA progression. Currently, there are three clinical trials targeting amyloid-β to treat AMD. MRZ-99030, developed as eye drops, is a dipeptide containing d-tryptophan and 2-amino-2-methylpropionic acid designed to modulate aggregation of amyloid-β. RN6G is a humanised antibody to prevent accumulation of amyloid β-40 and β-42 and is delivered by intravenous injections. Both treatments completed phase I studies to assess their safety and tolerability.47 ,48 GSK933776 is a humanised monoclonal antibody intended to modulate levels of amyloid-β. A phase II trial to investigate the safety and efficacy of GSK933776 in patients with GA secondary to AMD is currently ongoing. One hundred and eighty-four patients with GA aged 55 years and older will receive 3, 6 or 15 mg/kg of GSK933776 via intravenous infusion. The primary outcome is to measure the rate of change in GA area from baseline to 12 and 18 months. The secondary outcome is the change in BCVA from baseline to 18 months. Accumulation of lipofuscin and melanolipofuscin granules have been observed at the sites of RPE atrophy in GA eyes and associated with the GA pathogenesis. 49 ,50 Lipofuscin consists of products of peroxidation-derived protein modifications and the advanced glycation end products.51 Oxygen uptake in lipofuscin leads to formation of singlet oxygen, superoxide anion and hydrogen peroxide.52 A2E, derived from vitamin E, is a byproduct of the visual cycle and a component of lipofuscin. A2E was shown to be phototoxic to RPE cells in vitro.53 ,54 Oxysterols are generated as byproducts of visual cycle by peroxidation of cholesterol, steroid and fatty acids, and metabolised predominantly in RPE cells. Excess accumulation of oxysterols in the lipofuscin pockets or in Bruch's membrane leads to RPE and photoreceptor cell death. It also acts as an attractant for macrophages to induce inflammation.55 Because of documented lipofuscin phototoxicity, targeting lipofuscin and the visual cycle has been proposed as an approach for treating AMD. Emixustat is a nonretinoid compound that directly modulates the biosynthesis of visual chromophores through inhibition of RPE-specific protein isomerase 65 (RPE65). RPE65 converts all-trans retinal to 11-cis retinal so it can re-enter the visual cycle. 58 ,59 Emixustat also binds to RAR/RXR retinoid receptors or antagonise retinoid-binding proteins. Phase II/III clinical trial is ongoing to determine whether orally delivered emixustat hydrochloride (ACU-4429) reduces the rate of GA progression by measuring GA area and BCVA in 480 recruited patients (55 years and older) in a 24-month period. ALK-001 is a modified form of vitamin A, in which three ordinary hydrogen atoms have been replaced by non-radioactive, heavy hydrogen atoms. The changes embodied in the ALK-001 molecule make it more difficult to form toxic vitamin A dimer (P2E), a byproduct of vitamin A recycling process contributing to lipofuscin formation in RPE cells.60 In vitro results showed that ALK-001 caused approximately sevenfold decrease in the formation of toxic vitamin A aggregates.61 A phase I study was designed to assess the safety and pharmacokinetics of oral ALK-001 capsules in 40 healthy volunteers (21–70 years old) with no results posted yet. MC-1101 is an FDA-approved oral antihypertensive drug. Its active substance, hydralazine, has been shown to increase choroidal blood flow in ocular hypertensive rabbit models and facilitate retinal function recovery following ischaemic insult in rat eyes. 64 ,65 It also prevents the rupture of the Bruch's membrane and has anti-inflammatory and antioxidative properties.66 Phase Ib clinical trial showed that topical instillation of 1% MC-1101 produced no significant cardiovascular effects or ocular toxicity; no effect on the blood–eye barrier was noted. Phase II/III is ongoing, and 60 patients (50–85 years old, with early to intermediate dry AMD) will receive topical 1% ophthalmic solution and be assessed for visual function over 24 months. Based on the preclinical data, the first clinical trials investigating the subretinal transplantation of hESC-derived RPE cells have been approved by European and American regulatory authorities. Phase I trials were designed to test the safety and tolerability of grafted hESC-derived RPE cells in patients with either dry AMD or Stargardt's macular dystrophy.74 The data showed that transplanted cells persisted at 4 months after transplantation with no signs of rejection or evidence of hyperproliferation or tumourigenesis. In addition, functional recovery was observed in patients receiving hESC-derived RPE. Based on these, two phase I/II trials were performed with 18 patients enrolled. The patients received subretinal injections of 50 000–150 000 RPE cells75 and followed up for a median of 22 months (12–36 months). Results showed BCVA improvement compared with non-injected fellow eyes, also vision-related quality-of-life had improved in patients with atrophic AMD and Stargardt's disease. This study provided the first evidence of the medium- to long-term safety, survival and biological activity of the stem cell-derived cells in human disease. There are currently two other clinical trials using hESC-RPE cells (MA09-hRPE). Both are designed to evaluate safety and tolerability of subretinal injection or transplantation of MA09-RPE cells in patients with dry AMD. Both studies are recruiting patients aged 55 years and older, who will receive 50 000–200 000 MA09-hRPE cells. The primary outcome of both studies is to evaluate the safety of hESC-derived RPE cells. Secondary outcomes will measure the mean change of BCVA, autofluorescence photography and reading speed. In a separate study, clonogenic human central nervous system stem cells (HuCNS-SC) will be evaluated for treatment of dry AMD.76 In vivo studies in rats showed that transplantation of the HuCNS-SC cells preserve the number of photoreceptors and their visual function in rodent model of retina degeneration. 77 ,78 Phase I/II study will investigate the safety and preliminary efficacy of unilateral subretinal transplantation of HuCNS-SC cells in subjects with GA secondary to AMD. GA is a devastating blinding disease without any cure currently available. However, numerous clinical trials are ongoing with the goal of finding a viable solution to prevent or treat the disease. These therapies target different aspects of GA, including inflammatory pathways, oxidative stress and RPE degeneration, byproducts of the visual cycle, restoration of choroidal perfusion, and replenishing RPE cells with stem cell-derived RPE cells. Some of the trials hold great promise. The AREDS trials show that AREDS formulation reduces the risk of AMD progression by 25%–30%, whereas transplanted hESC-derived RPE cells show medium-term and long-term safety, graft survival and possible biological activity shown by improved vision acuity in patients with GA.
Future studies should focus on understanding the pathogenesis of the disease, which remains unclear. The precise delineation of pathological processes within the retina is especially valuable to gain insight of AMD, thus, the correlation between function and morphology play a pivotal role in diagnosing the disease. Clinical studies use FAF imaging to evaluate progressive enlargement of GA. FAF is based on the optical properties of lipofuscin and photoreceptor degeneration products and allows observing lesion areas. The development of advanced imaging system provides state-of-art tools for analysing GA pathophysiology and testing new therapeutics. In this regard, the recent development of spectral domain optical coherence tomography (SD-OCT) and polarisation-sensitive OCT (PS-OCT) technologies allows high-resolution structural imaging of the retinal and subretinal layers, providing powerful methods to quantify GA lesion size and grade GA progression.79–81 These new insights in GA morphology using novel retinal imaging strategies are important to design new studies appropriately. For therapeutic research, it would be critical to test the long-term safety and efficacy of the current hESC- or iPSC-based RPE transplantation approach for GA. Other approaches, including innovative approaches to prevent RPE degeneration, should also be explored. Learning from the clinical trials, going from bedside to the benchside, then back to the bedside could lead to better understanding of the AMD mechanism and better therapy for the disease. The authors thank Chastain Anderson for proofreading the manuscript.
. The Global economic cost of visual impairment. AMD Alliance International, 2010.
. mTOR's role in ageing: protein synthesis or autophagy? Aging (Albany NY) 2009;1:586–97.
. Amyloid-beta is found in drusen from some age-related macular degeneration retinas, but not in drusen from normal retinas. Mol Vis 2003;9:184–90.
. Fundus autofluorescence and development of geographic atrophy in age-related macular degeneration. Invest Ophthalmol Vis Sci 2001;42:1051–6.
. Fundus autofluorescence in age-related macular disease imaged with a laser scanning ophthalmoscope. Invest Ophthalmol Vis Sci 1997;38:478–86.
. Is dry AMD treatable? A new ophthalmic solution may halt disease progression. Retina Today 2012:69–79.
. Effects of hydralazine on ocular blood flow and laser-induced choroidal neovascularization. Int J Ophthalmol 2009;2:324–7.
. Effects of hydralazine on ocular blood flow laser-induced choroidal neovascularization. Int J Ophthalmol 2009;2:324–7.
. Age-related Macular Degeneration. Springer Science & Business Media, 2012.
. Molecular characterization and functional analysis of phagocytosis by human embryonic stem cell-derived RPE cells using a novel human retinal assay. Mol Vis 2009;15:283–95. Contributors Jakub Hanus wrote and edited the manuscript. Fangkun Zhao wrote the manuscript. Shusheng Wang wrote and edited the manuscript. Funding US Department of Health and Human Services > National Institutes of Health > National Eye Institute EY021862. Startup fund from Tulane University. Career development award from the Research to Prevent Blindness foundation and Bright Focus Foundation Award in Age-related Macular Degeneration.